This Pleasant Land: A Blue Ridge History, is available for sale via mail (see ordering information below). This book may also be purchased in Floyd, Virginia, at Slaughters Supermarket and at the Floyd Country Store. Those traveling along the Blue Ridge Parkway may purchase the book at Mabry’s Mill and the Rocky Knob Visitor Center. Click the cover image above to see a larger view of the book’s cover. This book by Max S. Thomas has been published posthumously by Harvestwood Press. It is a 250-year history of the border areas of Franklin, Floyd, and Patrick Counties in the Blue Ridge Mountains of southwestern Virginia. The book covers an area reaching out in all directions from the epicenter where the author lived by the Blue Ridge Parkway. This Pleasant Land’s ISBN is 978-0-9703758-2-7 and its Library of Congress Control Number is 2009936070. This limited-edition paper-back book has about 200 pages and it contains 20 photographs from the Thomas family archives. It also contains a hand-drawn map by the author. This Pleasant Land is Max Thomas’s second book. His first, Walnut Knob, is a collection of stories and songs. Published in 1977, Walnut Knob is once more out of print, after three printings. Copyright for Walnut Knob was renewed in 2005. This book is available by mail and at some stores in the Floyd County, Virginia–Blue Ridge Parkway area. Cost of each book is $15.95 + $0.80 tax (Virginia only). For orders shipped within the contiguous United States, cost of media shipping & handling is $3.00 per book and $0.50 for each additional book. Orders should be mailed to: Harvestwood Press, P.O. Box 395, Floyd, VA 24091. Make out checks to Harvestwood Press. For more information, or to arrange for faster shipping, send an e-mail to info@HarvestwoodPress.com or phone (540) 745-3173. This Pleasant Land is being sold in Floyd, Virginia, at Slaughters Supermarket and at the Floyd Country Store; it is also for sale along the Blue Ridge Parkway at Mabry’s Mill and at Rocky Knob visitor center. Editor’s Note: Beginning in 1997 when he was eighty-nine years old, the author began writing a 250-year history of life in the Blue Ridge where he lived. He spent about two years writing in longhand. That work follows in Part I of this book. Some of the author’s earlier writings are included in Part II. Editor’s Note: The author was a life-long, prolific writer and historian. Some of his early, undated pieces about life in the Blue Ridge are included in the remaining chapters that follow. A new book by Max S. Thomas is now available. 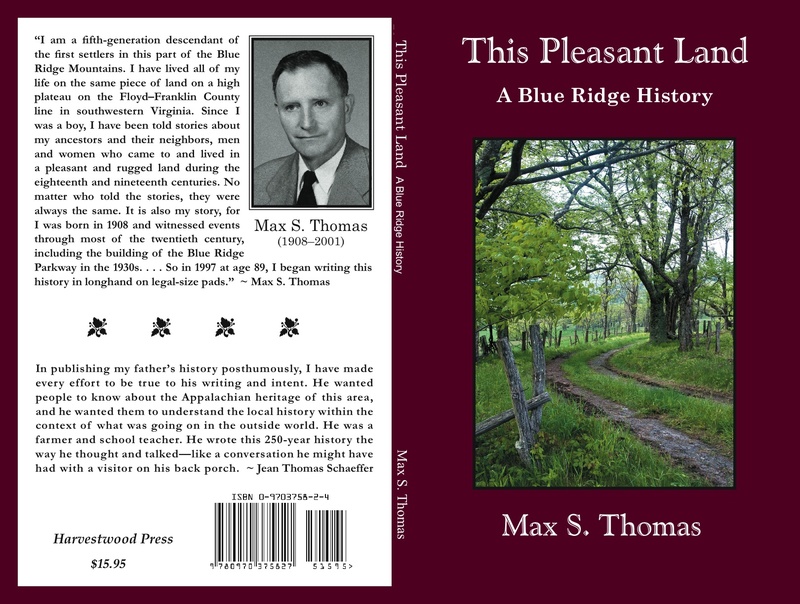 Titled THIS PLEASANT LAND: A Blue Ridge History, it has been published posthumously by Harvestwood Press. The author’s daughter, Jean Thomas Schaeffer, has served as editor, compiler, and publisher of the book. This Pleasant Land is a 250-year chronological history of the border areas of Floyd, Franklin, and Patrick Counties in the Blue Ridge Mountains of southwestern Virginia. The book covers an area reaching out from the epicenter where the author lived by the Blue Ridge Parkway. The book is a local history but it is written within the context of what was happening in the outside world during the 18th, 19th, and 20th centuries. This paperback book has about 200 pages and begins with the first settlers coming to the area. The book goes on to explain how certain events impacted the local people – events such as the American Civil War, Reconstruction, the American chestnut blight, the Great Depression, the building of the Blue Ridge Parkway, and World War I and II. The last half of the book is a collection of the author’s earlier writings on a variety of topics such as early music, the language of the area, early roads, the mountain economy, country stores, old-time tools, fences, foraging, early marriages, women and their lives, photography, weather, geology, critters and maladies that caused problems, passing on, old-time medicine, and communicable diseases. One chapter tells about Sparrel Tyler Turner who represented the area in the Virginia House of Delegates and the Virginia State Senate. The book has twenty photographs, including a picture of Turner. For more information about this book, send an e-mail to info@HarvestwoodPress.com, or phone (540) 745-3173. The book’s ISBN is 978-0-9703758-2-7. This is the author’s second book. His first, Walnut Knob, was first published in 1977 and is a collection of songs and stories of the area. Its copyright was renewed in 2005 but, after three printings, Walnut Knob is once more out of print. Cover Design and Front Cover Photograph are by John R. Coiner, Jr.